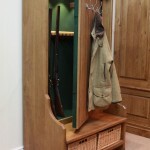 The Bespoke Furniture Company builds this bench with a coat rack with a concealed 16 gun cabinet hidden inside. 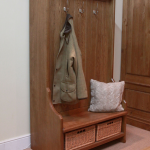 The bench is made of oak and works great in foyers, kitchens and mudrooms. The cabinet is equipped with LED lighting.